Perfect pan seared chicken thighs with a shallot-white-wine pan sauce. Cheap, easy, and painfully good - elegant enough for company. Pat chicken thighs very dry and then season very liberally with sea salt. 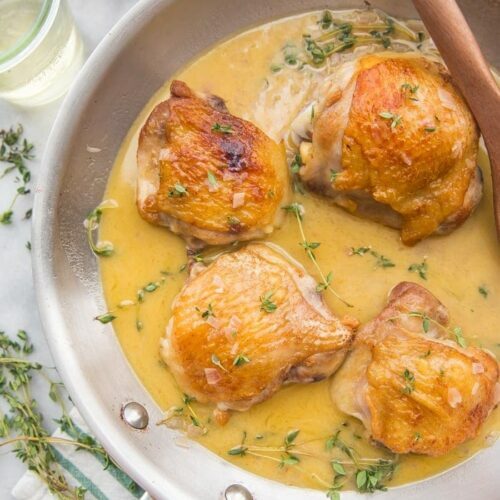 Heat oil in an oven-proof skillet over medium-high heat until very hot, then, using tongs, place chicken thighs skin-side down in skillet and sear for about 7-8 minutes, or until skin is golden brown and no longer sticks to the pan. Flip chicken thighs then transfer skillet to oven. Roast 15 minutes or until internal thermometer registers a temperature of about 162º. Carefully remove skillet from oven. Be careful: always using a potholder on the skillet handle during the rest of the recipe. Transfer chicken thighs to plate, then pour off all but about 1-2 tablespoons fat from skillet. Return skillet to stove over medium-low heat. Add shallots and sauté, stirring regularly, until softened, about 2-3 minutes. Carefully add white wine and deglaze, scraping the skillet with a wire whisk or spatula to loosen all the browned bits on the skillet. Bring wine-shallot mixture to a boil then reduce by half. Add chicken stock and again bring to a boil. Reduce mixture by half, or until mixture is no longer soupy but thicker, like a sauce. If using fresh herbs, stir in now. Remove from heat and stir in cold butter, whisking constantly until melted. Season with salt. Serve thighs over starch, then ladle plenty of pan sauce over. Make sure you try my quick chicken brine recipe with these perfect pan seared chicken thighs and pan sauce!